When did "edge" become a position? Until like a few hours ago, there were 4-3 defensive ends and 3-4 outside linebackers who were the primary pass rushers. 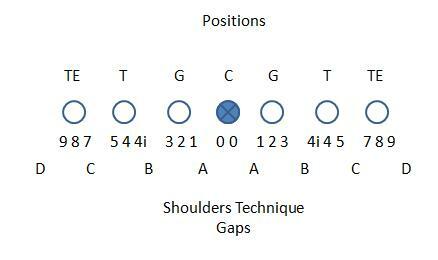 And they weren't interchangeable - 4-3 DEs were generally bigger and 3-4 OLBs were generally lighter and more athletic. Are these two positions now generally seen as the same, manned by players with the same skillsets? seems like a nice trendy way of saying outside. They generally mean weakside (whether DE or OLB) but not always. What does the number in "___ technique" signify? Some guys are better 34 OLB fits and some project better to 43 DE. But it is useful to group them together when discussing free agency as guys that can rush the QB (from OLB or DE) will get paid a premium. Thanks - so it more or less refers to the gaps covered by the DL - never realized that. I always foolishly assumed that a "five technique" did five things really well, like a five-tool player in baseball. Many people here have been saying for years that the 4-3 vs 3-4 debate is dumb because teams run multiple fronts so players are interchangeable. Edge Rusher started to become popular with James Harrison, Terrell Suggs, Von Miller. Guys whose teams had a "BASE" 3-4 but these guys could put their hand in the dirt. Defenses changed. There is less of a distinction between 3-4 and 4-3, most teams are running some sort of hybrid. Edge is a cleaner way of describing an outside pass rusher without getting overly wordy. and what their responsibilities are. For example, a 0/1 technique is primarily a space eater like Snacks whose primary role is to occupy blockers. Whereas a 3T DT is more of a penetrator. I believe after the Snacks trade, DG stated that they view Tomlinson in the 0/1T role and Hill as a 3T penetrating DT, which he did fairly well as evidenced by his 5.5 sacks. I view the increased usage of the term "edge rusher" as coinciding with more people being familiar with the salary cap and free agency in general. Comparing Suggs or Von Miller to other elite LBs (e.g. Keuchly) makes less sense than comparing them to other elite pass rushers who happen to play most of their snaps with their hand in the dirt (e.g Watt, Lawrence, etc). Salary wise their are pass rushers and then there are other LBs/DL. In comment 14356302 Thanks - so it more or less refers to the gaps covered by the DL - never realized that. I always foolishly assumed that a "five technique" did five things really well, like a five-tool player in baseball. LOL! Yeah, I had never heard 0 technique until I read that PFF piece. It now makes sense. If you are running a one gap style 3/4, then one way you do that is run blitz interior gaps using lbs. Or a variation on that, switch up assignments between an lb and the rush DT from down to down. And therefore you need a couple of not too weak, not too skinny lbs. And, being a pass happy league, one needs a few lbs that can defend pass. That's why I talk about it as a 5-0-6. Aaand, the 2 stout lbs....not only from the 'edge'...it's -any- gap. Ha. I was thinking the same thing. I think the first person I saw usually it regularly was actually Sy'56. But now it seems to be everywhere. It is a fancy way of telling your player what shade or gap to play. Teams are in Nickel more than half the time so teams are almost always in some form of 4-2-5 alignment.. if those "4" pass rushers are LB's are DE's doesnt matter. in a 4/3 defense versus a 3/4 defense. ? For example. In a 3/4 DE, some may ask the player to square up on an OT, cover with gaps, and allow the LBs to react clean. OR ...your 3/4 DE could be asked to line up directly IN the (b?) Gap, possibly with a LB lined right up in the next gap over, or a nose tackle doing double duty for one play to accommodate that. So it's both a very different 3/4 DE and also a different LB skill set...or alignment visa vis I side and out. In all of the discussions on this site last year over switching from a 4-3 to a 3-4, I never saw anyone refer to Vernon or JPP as "edge" players. They were 4-3 DEs, and the question was whether they had the skillsets to play 3-4 OLB. I've only perceived this "edge" position to have started in the last few months. For instance, I've only ever seen Josh Allen of Kentucky referred to as "edge." So does that mean that whether a team runs a 4-3 or 3-4, it doesn't matter, and he'll rush the passer from whatever defense is being run? Or have defenses evolved so drastically over the past 12-18 months that the 3-4/4-3 distinction is now gone? for a long time. But "edge" or "ER" only seemed to appear used widely about 2 years ago. But that's just me. or teams have been drafting college OLBs and DEs and depending on scheme changed their positions so much in the last few years that they just refer to them as "Edge Rushers"
As meaning a guy is athletic enough that he can play both 4-3 DE or Stand up 3-4 OLB. I�ve seen some guys are listed as pure DEs or OLBs. Nick Bosa and Clelin Ferrell are mostly listed as DEs. Josh Allen and Jachai Polite I�ve seen listed as a pure 3-4 OLB. Guys like Sweat and Burns I�ve seen listed as EDGE. I made the same comment on a different thread a few weeks ago. I don't like the term "edge" defender. It's basically just a repackaged term for the old late 90s term of "tweener" or the previous term of DE/OLB. The apparent difference mainly being that back in the late 90s and early 2000s 3-4 defenses were not en vogue the same way they were in the 80s and early 90s, so 3-4 pass rushing OLBs were not considered to fit a particular position in the 4-3 very well, hence the term "tweeners". In the last few years, with a slightly expanded number of teams using the 3-4 and, perhaps more importantly, the great expansion of nickel and dime packages, these so-called "tweeners" became more valuable as pass rushers and even against defenders who might help set the edge in run defense against more spread offenses. But at the end of the day, they're pretty much the same thing as a "tweener" or a DE/OLB. Agree. I think it really began at least before last year's draft. I don't recall the term being used in the 2017 draft, but it could have been. Hence the distinction. Not really that hard. You can be a SAM kind of linebacker with limited pass rushing skills, or a WIL, who is good in coverage with limited pass rushing skills. In both cases, you would be an OLB. An EDGE guy means you get to the QB. That's the difference. When Mike Mayock made it one. Duh. This pretty much explains it. -Larger LB size (240 -265 lbs) who will put his hand in the dirt at line of scrimmage. - has exceptional burst to provide relentless pursuit from the edge (wide, inside, or bullrush OT) with not much stunting. - provide a little run support on the edge and short flat pass coverage. I agree with Paulie that the term was first used to describe how the Giants utilized Lawrence Taylor. Fortunately for us he also happened to be incredibly stout against the run, extended his pursuit to the other side of the field to make tackles at the line of scrimmage, and could drop back 5-15 yds in pass coverage. For today's game, Vonn Miller is your proto-type.